MANILA — On May 23, one year ago, the Marawi siege began — the signal fire for the Duterte administration to impose martial law in the entire island of Mindanao, causing the destruction of the whole city of Marawi, the displacement of one of the largest Muslim communities in the Philippines, the deployment of more military battalions — laying the groundwork for more foreign investors and companies to exploit natural resources in the region. 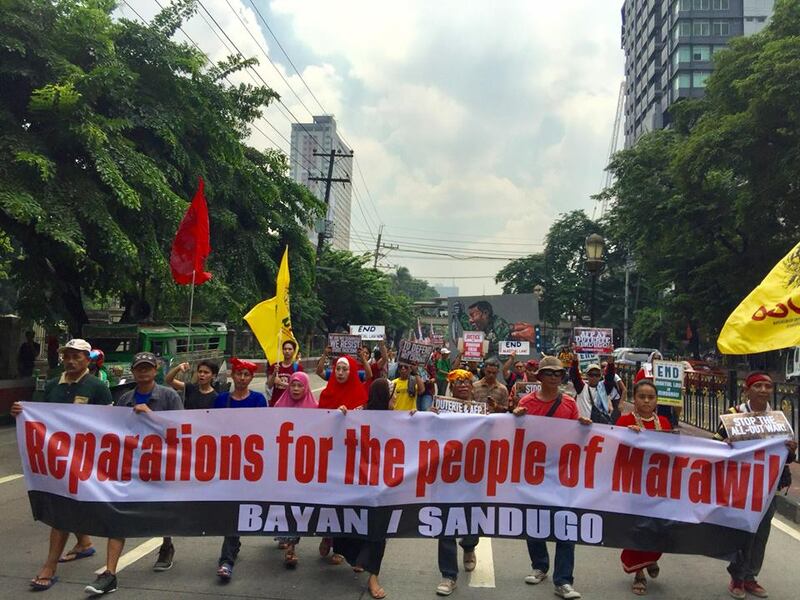 On May 23, this year, various progressive groups led by the Bagong Alyansang Makabayan (BAYAN) and Sandugo – Movement of Moro and the Indigenous People for Self-Determination (SANDUGO), held a protest march from the University of Sto. Tomas (UST) to the Mendiola Peace Arch to demand for an end to martial law in Mindanao. Twice extended — controversially, legally questioned and allegedly politically-motivated — Mindanaoans and pro-people groups now call for an end to martial law. “There is no such thing as humane martial law. It is akin to the military rule of Marcos in the 1970’s. 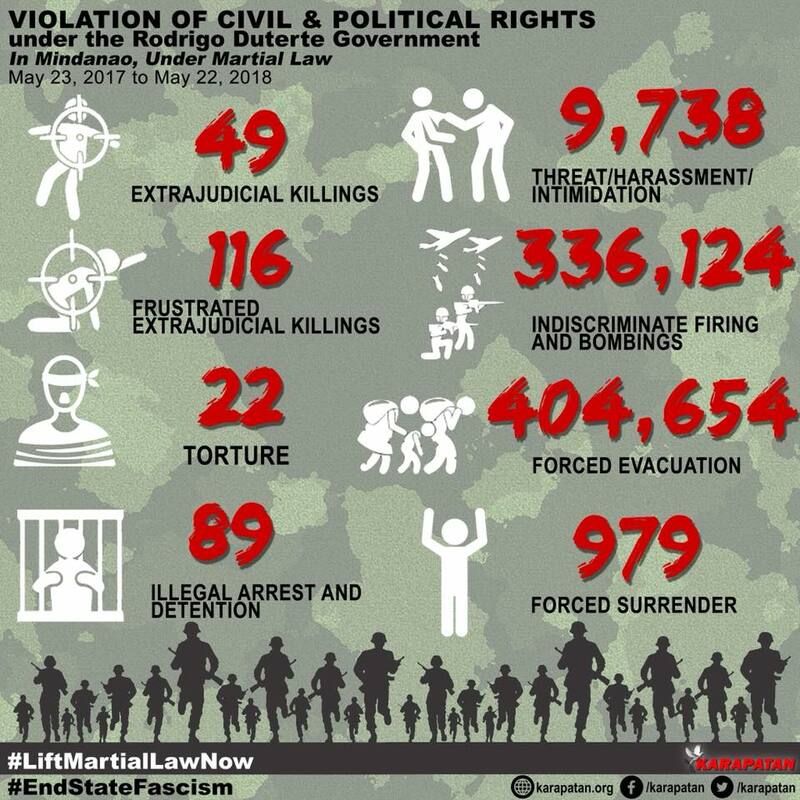 Martial law targeted civilians then as it is now. Thus, it should be immediately lifted and ended and those responsible for the abuses against the people should be held accountable,” Anakpawis Partylist Representative Ariel Casilao said. “I personally experienced being chased by armed units of military when I joined the fact-finding mission in February, where lumad farmers where massacred; and during the fact-finding in April, conversed with the families of victims of extra-judicial killings under martial law, we faced first-hand of how the military has been given vast powers and abused that power, like how they tried to stop our mission, deploying checkpoints 13 times, eight against our Caraga team, while six against us in the Davao region team. We were also confronted by a military-instigated ploy where supposed pro-martial law civilians barred us from proceeding to an area where human rights violations by state security forces occurred,” he shared. Now in Manila, leaders of indigenous peoples and Mindanaoans aim to share their stories of martial law — unfiltered — stories, which are more often than not, either hard to obtain due to media censorship or denied and claimed false by the Duterte administration. “Ang martial law ni Duterte ay nagdulot ng terorismo sa komunidad sa buong Mindanao. Ang martial law ni Duterte, walang ibang kahulugan ito kung hindi ang pambobomba, pagpatay, at lalong pagpapahirap sa mamamayan sa Mindanao. Ang martial law ni Duterte ay nagdulot ng napakaraming paglabag sa ating mga karapatang pantao,” Jerome Succor Aba, co-chairperson of SANDUGO, said during the mobilization. “Terorismo ng estado ang ibig sabihin ng martial law sa Mindanao,” he emphasized. (“Duterte’s martial law has resulted in terrorism in different communities in the entire Mindanao. Duterte’s martial law means nothing but bombings, killings, and greater oppression of the people of Mindanao. Duterte’s martial law has resulted in nothing but numerous human rights violations. In fact, even during the Marawi siege, the Duterte administration notoriously used aerial bombardments in order to ward off the Maute fighters. This caused the internal displacement of thousands of Maranaos and Moros and the destruction of mosques and madrasahs that the Duterte administration now refuses to rehabilitate. Seven months after the Duterte administration declared the “liberation” of Marawi City, Maranaws and Moros were left with nothing but rubbles of homes and unburied bones of family members, with an unparalleled record of human rights violations, relative to the past administrations. The Karapatan Alliance for Advancement of Human Rights revealed at least a total of 49 extrajudicial killings, 116 frustrated extrajudicial killings, 22 torture cases, 89 illegal arrests and detention, 9,738 cases of threats/harassments/intimidations, 336,124 cases of indiscriminate firing and bombings, 404,654 cases of forced evacuation, and 979 forced surrenderees during the first year of martial law in Mindanao. “Ang inilunsad na giyera ni Duterte ay hindi para durugin ang terorismo. Ang katunayan, ang gusto nilang patahimikin ay ang mamamayang nakikibaka sa Mindanao para sa sariling pagpapasya, para sa kanilang lupa, at para sa kanilang lupang ninuno,” Kerlan Fanagel of PASAKA said. Marawi City is ground zero — and remains to be one year after the siege. According to SANDUGO, the Philippine government’s rehabilitation efforts were limited to providing relief packs and temporary housing. Others were encouraged to return to their home provinces, providing them with a meager transportation and start-up assistance of only PhP 5,000. “A year after the Marawi siege, why are the victims still being ignored by President Duterte? He has visited Marawi City several times but he often mingles only with the soldiers and the military top brass but not the people who suffered from the heavy AFP bombardment of the city. It is as if they do not exist,” Bayan Muna Representative Carlos Zarate said. “Mabigat ang pananagutan ng gobyernong Duterte sa mamamayang Moro sa nangyaring pagkawasak ng Islamic City of Marawi. Ang abang kalagayan ng mga bakwit sa lugar ay pinalala pa nang itinigil ang pamamahagi ng relief at cash assistance,” said the Davao-based solon. Rehabilitation efforts remain to be profit- and investor-oriented. Despite rehabilitation being one of the main reasons that the Duterte administration asked for an extension of martial law, concrete plans have yet to be actualized. ACT Teachers Partylist Representatives Antonio Tinio and France Castro emphasized that the main reason for the reluctance to spend and to fast track the rehabilitation of the city is due to the supremacy of the Duterte administration’s neoliberal policies and interests. “While the government doubled the salaries of uniformed personnel and awarded soldiers who served in the Marawi siege compensation for their service, the government has also been gradually reducing basic social services for families and communities who were victims of the Marawi siege and martial law,” Castro said. “The people of Marawi will not be able to rebuild their city if the government plans to sell their land for big business interests and privatize their land despite the growing number of people experiencing poverty in the region,” Tinio stated. “Poverty in Marawi has increased since the Marawi siege and the declaration of martial law while the people are still being blocked by the government and prevented to rebuild their homes and their communities destroyed by the aerial bombings to pave the way for the different oligarchs and multi-national corporations, a consortium of Chinese and Filipino companies according to reports, who have expressed interests in ‘captalizing’ on Marawi after the siege and the continuous operations and explorations of mining activities and plantations owned by multi-national firm all over Mindanao,” he added. A research conducted by the Philippine Center for Investigative Journalism (PCIJ) also revealed that the winners to the deals for housing and road projects in Marawi were awarded to clans who have close ties with the President. Blacklisted Chinese firms were also favored in the projects for rehabilitation. Many have forewarned that the flimsy grounds upon which the imposition of martial law in Mindanao and its extension were based will set the foundation for the declaration of nationwide martial law. With the worsening fascist attacks, and a de facto martial law in the countryside outside of Mindanao, the formal declaration of a nationwide martial law is not too far behind. “Wag na nating hayaang ideklara ni Duterte ang martial law sa buong bansang Pilipinas. Ngayon pa lang, tayo ay magkaisa at padagundungin natin ang panawagan na wasakan na ang martial law sa Mindanao,” Fanagel said. “One year is already one far too long. We bore witness to how the military has become more emboldened, how the President has become more merciless in spreading a culture of bloodbath and mayhem. We dare not support, or even allow, for another year of martial law in Mindanao to pass. 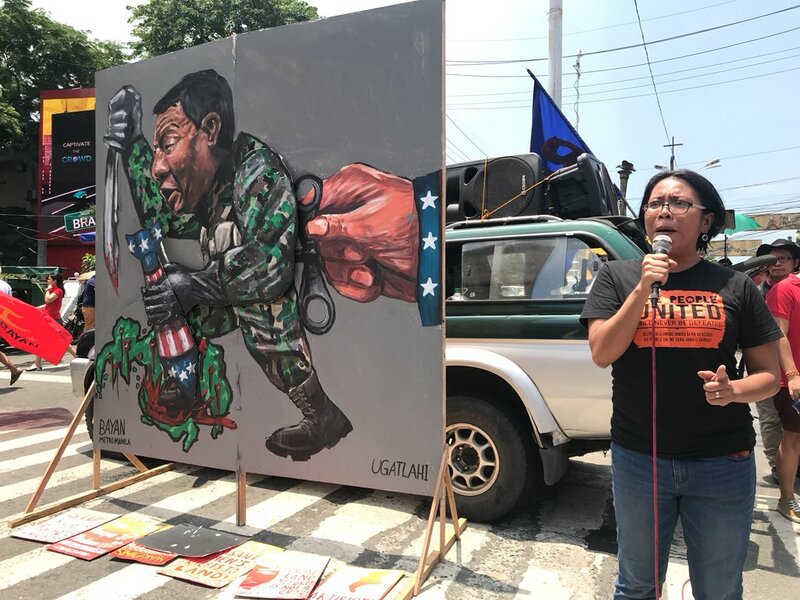 We shall continue to expose and oppose the atrocities committed by the Duterte administration not only in Mindanao, but in the entire Philippines now placed under de facto martial law,” Kabataan Partylist Representative Sarah Elago said in a statement. In April 2018, various progressive groups, along with international human rights workers, conducted an International Fact Finding and Solidarity Mission (IFFSM) in Mindanao. In exposing the facts and objective assessment of how martial law was implemented in Mindanao, a book will be released containing the accounts of Mindanaoans and the findings of the delegates. Seven more months of martial law in Mindanao is seven months more for the Duterte administration to unleash more battalions of military, more bombs and rockets, and more maneuvers to suppress the mass movement. So while the commemoration of the first anniversary of martial law is a salute to the Mindanaoans and the Filipino people who continue to fight despite the harassments and danger constantly attached to being a ‘dissenter’, it is also a renewal of commitment: a renewal of commitment to fight against tyranny, a renewal of commitment to resist the rise of another dictatorship.